Nose: A generous nose of candied fruits, oak, fruit, and orange peel. Aromas of autumn come to the fore; with vanilla and coffee notes. Palate: The mouth is deep and voluptuous; almost fleshy. The finish is long and extended with a wonderful fullness. It is intense and velvety with a strong rancio. This hors d’âge is a fine ode to the Petite Champagne cru, with an exceptional balanced taste. 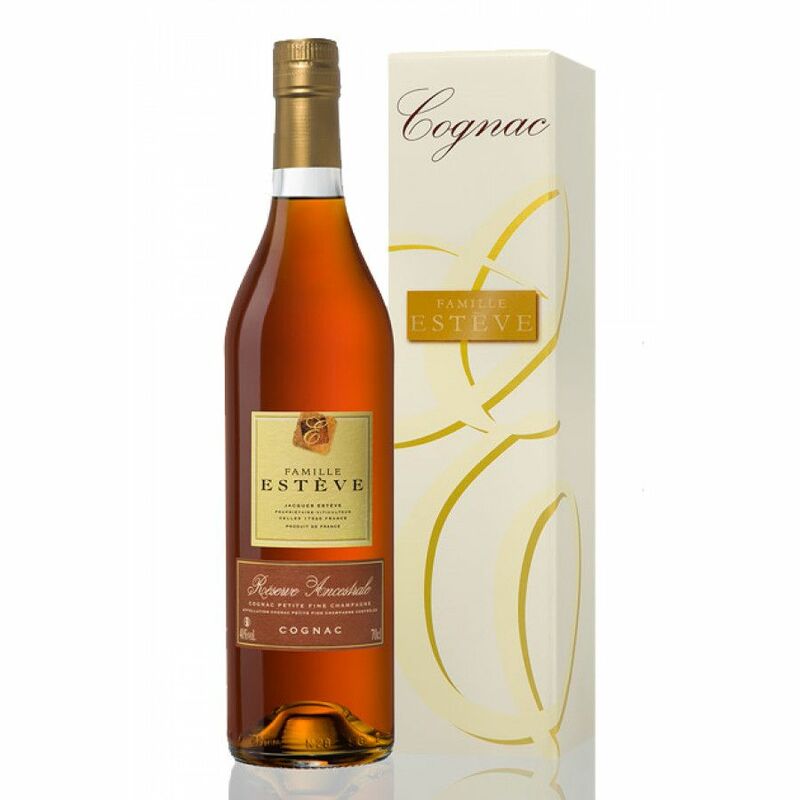 The Famille Esteve Reserve Ancestrale is aromatic, full-bodied and is well recognized among critics. Thanks to the wine-growing estate’s close proximity to both the Grande Champagne and the Petite Champagne, the chalky subsoil is practically identical and produces incredibly fine Cognacs just like that of the neighboring crus. Falling into the Hors d’Age age category, it has been aged, and carefully observed for over half a century. A fine and old selection of eaux-de-vie allow you to take a glimpse into various generations past, and feel the aromas unfold in front of you. The Reserve Ancestrale Cognac is everything you could need from a Cognac from this fine terroir. It offers a full bodied and strong rancio, the everlasting finish, and the elegant smoothness in your mouth. The family-run vineyard grow Ugni Blanc grapes and rely on the fine composition of the soil and millions of years of oceanic sedimentation to give such a celebrated viticultural estate. Typical of this region are the eaux-de-vie with a floral bouquet, an excellent rancio and a long finish. The grapes then undergo a watchful vinification process, and are then distilled on the lees in copper stills. The eaux-de-vie “sleep” in Limousin oak barrels, in the depth of the dark cellar, to be aged over long periods. Jacques Esteve knows the cellars like the back of his hand, and each of his eaux-de-vie respectively. The oldest of his selection are kept in the Paradis cellar, and he knows which will perfectly blend with one another to create a precious nectar such as the Reserve Ancestrale Cognac 70cl. Instead of reducing his eaux-de-vie to the desired degree of consumption, Jacques has his own unique method. He has enough eaux-de-vie in his prestigious collection to reduce using “faibles”; weaker versions of normal eaux-de-vie. It is truly an art form. This hors d’age is a wonderful digestif that should be enjoyed with chocolate or a light cigar. Enjoy it neat.